Project Greatest Gift, our church’s annual outreach to children and caretakers in the foster care system in Northern Colorado, was a success again this year. In the end, we were able to sponsor 241 children and caretakers in three northern Colorado counties. Additionally, we were able to take part in an event to meet and bless the families who were recipients of these gifts. Along with giving gifts, we were able to include materials in each bag explaining to each child and caretaker the hope that we have because of Jesus. One thing to pray about for 2019 is that Weld County (where the majority of our recipients come from) is considering cancelling their program next year. If that happens, White Fields would consider taking over the program from them. This would require significant resources, meaning we would likely have to expand what we do beyond our church. This might just be the next step God has for this project, but do pray for God’s leading and provision as we move forward! Project Greatest Gift, our outreach to foster children and their caretakers at Christmastime will be kicking off THIS WEEKEND at White Fields! Starting this Sunday after church, and going through the entire month of November, we will be taking sign-ups for those who would like to sponsor children this year to help make Christmas more joyful, and ultimately to introduce them to the hope that we have in Jesus Christ. Did you know that children in the foster system are an at-risk people group within our communities? In almost every case, the reason children end up in foster care is because of an unsuitable home environment, which often involves violence, neglect, drugs and crime. These environments not only result in trauma, but they are also associated with poverty. Many foster care situations are kinship care, which means the child is cared for by a relative, which can create a financial burden, especially in the case of grandparents living on pension. Poverty has a profound impact on a child’s mental and physical well-being. In other words, the suffering that a child who is raised in this environment endures is not only limited to their childhood, but can adversely impact the rest of their life. Our church, White Fields Community Church, has a history of ministering to children in the foster system. Through some of our leaders, we have developed a great relationship with the Health and Human Services departments in Weld and Adams Counties, and we are able to make an impact in the lives of needy families in our area. In recent years, we have had the special opportunity to get to meet and serve these families at a Christmas event we help put on for them in Greeley at which the gifts are distributed. If you would like to be involved, visit us on a Sunday morning this November, leave a comment below, or contact the church here. If you can’t participate but would like to support this endeavor financially, you can make a donation by clicking here, and choosing Project Greatest Gift from the drop-down menu. 100% of your donation will go straight to the kids and their families. Recently I told you about Project Back to School: White Fields Community Church’s annual summertime outreach to kids in foster care in conduction with Weld County Health and Human Services. This month-long project concluded today with some of us from the church delivering the backpacks to the case workers in Weld County. They will be delivered to these needy families in the coming days and weeks. This morning, Joe Cady, Pastor Nick and I had the great privilege of delivering the backpacks that you so graciously provided to 135 elementary, middle school and high school age foster children. As you all are well aware, each pack was filled with the needed school supplies for Weld County Schools. 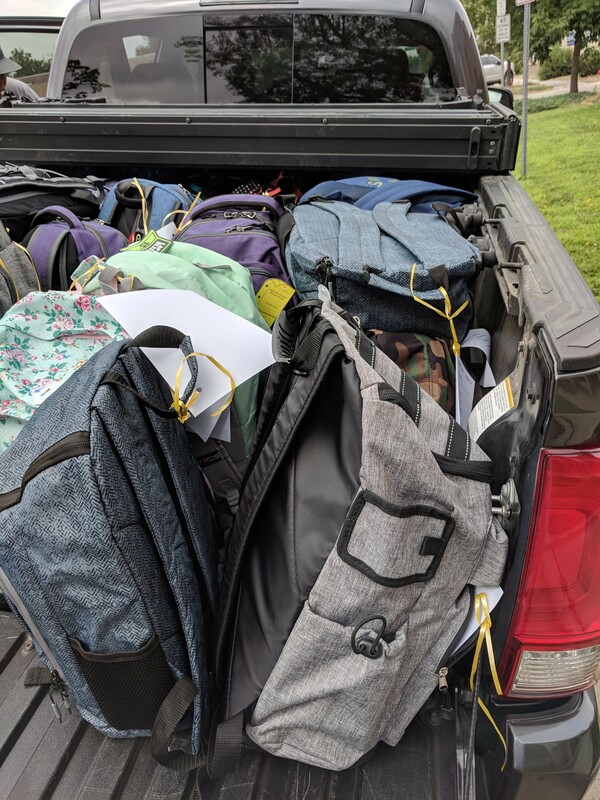 It took two pickup trucks to haul all of the backpacks to Greeley! 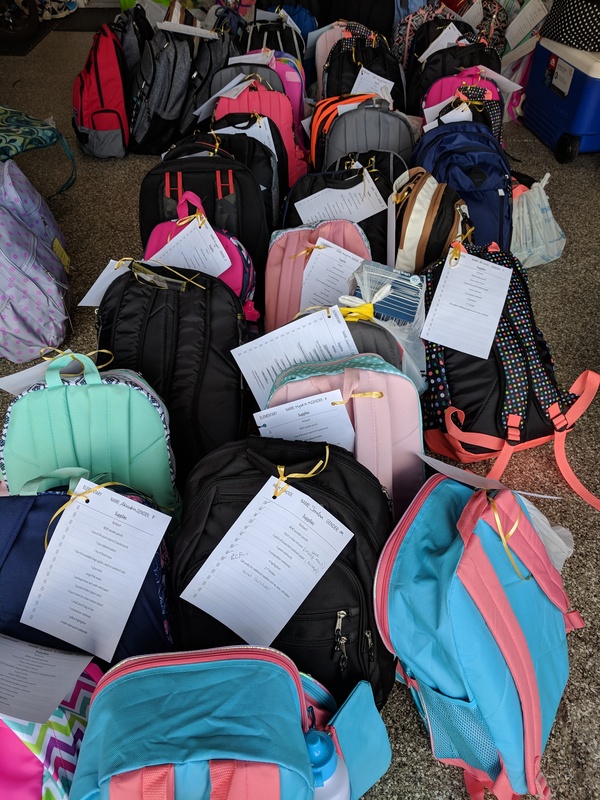 As we were unloading them at the facility, I was so moved when one of the Human Services workers commented that he is always amazed at how our church manages to provide this amount of backpacks and an incredible amount of gifts at Christmas. He said he wanted to know the secret of how a congregation is so engaged with their community! All of the Human Services case workers were incredibly appreciative and very excited to give each child their new backpack and supplies. This goes beyond just backpacks, you truly showed the love of Christ in a tangible way! It was great to see how excited the case workers were about the backpacks, having personal knowledge of the kids and the details of their situations. Please be in prayer both for the kids, their caretakers and these case workers who care so much about them. This is an ongoing outreach, so if you would like to be involved with either Project Back to School or Project Greatest Gift, contact White Fields by clicking here. Did you know that children in the foster system form an at-risk people group without in our own communities? In almost every case, the reason these children end up in foster care is because of an unsuitable home environment, which may involve violence, neglect, drugs, crime, etc. These environments not only result in trauma many times, but they also tend to result in or be associated with poverty. Many foster care situations are kinship care, which means the child is cared for by a relative, which can create a financial burden. One of the ways that we can help kids break out of this cycle of poverty is by encouraging them to stay in school – and one of the ways we can do that is by helping them have the things they need to be confident and excited about going to school, so they can succeed! Our church, White Fields Community Church, has a history of ministering to children in the foster system, and two years ago we began a new ministry: Project Back to School. We are working with Weld County Department of Human Services, and this year they have identified 135 at-risk kids who need help with school supplies, clothes and shoes. This is the most we’ve ever taken on. The first year we did 50, last year we did 100 – and this year we’ve accepted their request to provide for 135 kids! It’s a big step of faith, but we are trusting that God will raise up people to bless these families in the name of Jesus. It’s a way for us to love not only in words and in speech, but in action as well (1 John 3:18). If you would like to be involved, visit us on a Sunday morning this July, leave a comment below, or contact the church here. The article is a very insightful critique of the culture of parenting – or “religion of parenting”, as the author calls it – in our society, and the results of it. Of particular interest to me was how the author points out that there is an unspoken understanding in our society that the value of a human life peaks out at birth and diminishes from there. Today I talked with a great lady from our church who heads up an outreach called “Project Greatest Gift”, in which we provide Christmas gifts for children in foster care. Weld County told us that many of the children in foster care are living with elderly people, and they asked if we might be willing to provide gifts for the caretakers this year as well. This seems like a great opportunity for us to show that we value all human life, both young and old. In the 21st century, most Americans marry for love. We choose partners who we hope will be our soulmates for life. When children come along, we believe that we can press pause on the soulmate narrative, because parenthood has become our new priority and religion. We raise our children as best we can, and we know that we have succeeded if they leave us, going out into the world to find partners and have children of their own. Once our gods have left us, we try to pick up the pieces of our long neglected marriages and find new purpose. Is it surprising that divorce rates are rising fastest for new empty nesters? I think that one of the things the Christian church has done well is championing marriage. The writer to the Hebrews says: “Let marriage be held in honor among all.” (‭Hebrews‬ ‭13‬:‭4‬ ESV) I have had the privilege to see successful Christians marriages that thrived even after the kids left the house, because they made their marriage and not their children the center of their family. I certainly have noticed a huge push in media advertisements from oil companies claiming that fracking is safe – radio and television ads, not to mention internet marketing and mass mailers. What are your thoughts on fracking? Do you think that environmentalists are making a big deal about something which could potentially be a great thing for our nation? I like the idea of energy independence; I think the US should pursue it. At the same time, I’m glad to live in Longmont, where fracking has been banned. I like clean air and clean water and the whole fracking experiment seems risky to me. It seems hard to get truly objective information on the risks of fracking. Even the information that is put out about how safe and environmentally friendly it is seems to be from those who stand to benefit from it financially. Please let me know your thoughts on fracking below in the comments section. According to NerdWallet, Firestone, CO is the best place to own a home in Colorado. This article on the Firestone town website boasts that Firestone is 30 minutes from Denver, Boulder and Fort Collins. Curiously, they don’t mention that Firestone is also a short 30 min drive from everyone’s favorite Northern Colorado city: Greeley 🙂 However, Firestone clearly has closer ties to Longmont than to Greeley, even though Greeley is their county seat. My wife and I considered a home in Firestone when we were looking for a place to live in Longmont. We could have bought a nicer house for less money in Firestone than in Longmont, but in the end, my wife doesn’t like rural areas and we were afraid that if we lived in Firestone we wouldn’t have many visitors because people wouldn’t be willing to make the drive out. For some people that might be part of the appeal! Whether it’s true or not, we may never know. However, with Firestone being right in the middle of everything in Northern Colorado, it would go to figure that living there you spend a lot of time in the car no matter where you want to go. Another factor in why we moved to Longmont rather than Firestone is because I wanted to be as close to the mountains as I could afford – so we specifically wanted to live in Northwest Longmont, near to MacIntosh Lake, Rabbit Mountain, Lyons and Estes Park. What do you think? Any Firestone residents out there who want to chime in and let us know the joys and/or difficulties of living in “the best place to own a home in Colorado”? One of the great outreaches we do here at White Fields church in Longmont is a home-grown initiative called Project Greatest Gift, which is our ministry at Christmastime to children in foster care. Project Greatest Gift has been a tradition at White Fields since the beginning of our church, but in the past it was limited in the number of families we were able bless. After looking at ways to broaden its impact on the community and considering alternative programs such as Operation Christmas Child, we decided to attempt to bless the “orphans” of Northern Colorado. Since no orphanages existed in this area, God led us to reach out to local foster families. A couple in the church was heavily involved in the foster system and they offered to make contacts within that system to find families in need. Beginning in 2009, as a result of God’s provision and their efforts, we were able to begin blessing the foster families in Weld and Adams counties through the generous gifts of the congregation at White Fields. Over the years, we have continued to see God’s great provision for us so we are able to continue to share His abundance with others. In past years, our church family has provided gifts for around 40 to 60 kids. This year we have had a great outpouring of generosity, and people from our congregation have signed up to provide gifts for 90 children in Adams and Weld counties! For those of you unfamiliar with the purpose of foster care, it is safe homes, loving caregivers and other family members who take in and provide for children whose living situation is unsafe. Unfortunately, through no fault of their own, many children live in homes with parents addicted to drugs, who are neglectful or abusive, or who do not know how to care for children appropriately. So foster homes are critical to meet the needs of these children while birth parents work to recover and learn to parent. Sometimes, foster homes are also where children’s needs are met while they await a forever home through adoption. Children in foster care experience grief and loss. Even when their living situation was unsafe, children mourn its loss, as that is all they had ever known. Foster parents serve not only as loving caretakers, but often also as counselors as they help the children in their care through this grief and loss. We are so thankful that we can in some way bless these foster families too by helping provide gifts at Christmastime. In addition to the blessing of Christmas gifts, please pray for these children that they would soon have a forever family, and more importantly, that they would come to know Jesus Christ as their savior, and God as their Heavenly Daddy.